The well-supported No Fun No Gain made no mistake with a smart win in the $50,000 Class 4 Division 2 race over 1200m on Friday night. Ridden by Daniel Moor, the Pins three-year-old colt settled as the meat in the sandwich in the early stages, flanked by leaders Copacabana (Michael Rodd) and Smart Warrior (Syahir Abdul), before he eventually stamped his superiority inside the last 150m. Copacabana did try to thwart the $17 favourite, but once Moor produced the whip to winning effect, the race was all over. 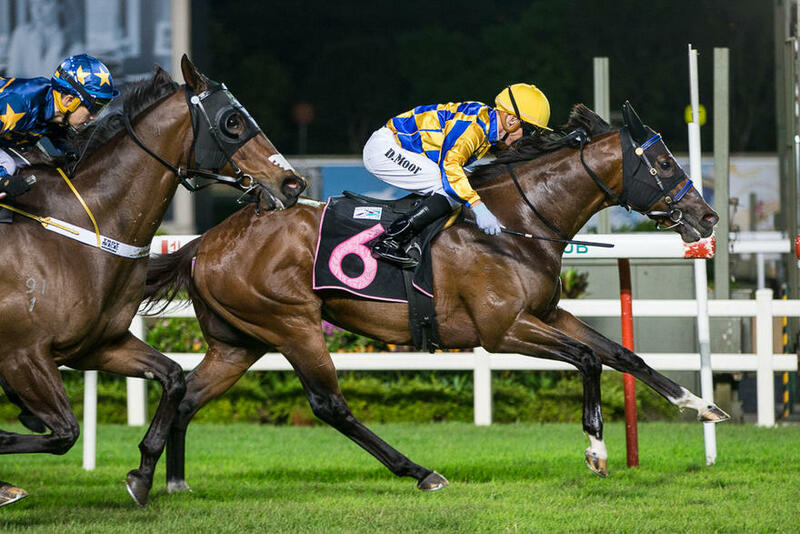 Lim’s Reform did charge home late, but it proved too little too late as he settled for a third second place in a row for Troy See (who was shaking his head in disbelief at picking up another bridesmaid tag as he weighed back in). The winning time was 1min 11.26secs for the 1200m on the Long Course. All honours to No Fun No Gain, who has bounced back to the winner’s circle after going astray at his second start following his all-the-way debut win in a Restricted Maiden race over 1200m on September 14. “We were expecting and hoping for a win,” said a relieved Stephen Gray. “We put him out after his last start and brought him back. He’s a colt and won a super race at his first start. “Dan has spent a lot of time with him. He’s a bull and not easy to ride, and he should be gelded, but the owners don’t want to geld him. When asked if No Fun No Gain could be a Singapore Three-Year-Old Challenge prospect, Gray did not rule it out, even if he knew there would be some tough opponents in the way. “Shane’s (Baertschiger) horse (Bold Thruster) and Steven’s (Burridge) horse (Lim’s Lightning) will be hard to beat, but my horse is looking for the mile,” said the Kiwi handler. The Australian jockey, who was at his first 2019 winner, has a high opinion of No Fun No Gain, but said that the penny had not dropped. “It was extremely satisfying to see him win tonight, especially as it’s been a slow start for me after the hand injury,” said Moor who fractured his hand in a pre-trial incident towards the backend of last year. “I’m very thankful to Stephen Gray for the support. It’s been full on all the way through. “I had this horse where he wants to be, but he didn’t quite switch off as he is still very brilliant at this stage. “He’s still very colty. He’s like my son, he would tell me to bugger off, but he has such an explosive turn of foot. With that second win, No Fun No Gain has taken his stakes money close to the $75,000 mark for the Go Go Racing Stable.